09/1996-07/1999 Ph.D. in Changchun Institute of Physics, Chinese Academy of Sciences. Major in liquid crystals. 09/1992-07/1995 M. Sc. in Changchun Institute of Physics, Chinese Academy of Sciences. Major in liquid crystals. 09/1985-07/1989 B. S. in Department of Physics, Liaoning University. Major in Optics. 07/1999-08/2001 Changchun Institute of Optics, Fine Mechanics and Physics, Chinese Academy of Sciences.Jilin Province. 09/1989-09/1992 Xinming Normal School, Liaoning Province. H. Ren, S. T. Wu, and Y.-H Lin, "In-situ observation of fringing field-induced phase separation in a liquid crystal and monomer mixture", will appear in Physical Review Letter. H. Ren and S. T .Wu," Tunable-focus liquid microlens array using dielectrophoretic effect", Optics Express, 16 2646(2008). H. Ren, D. Fox, B. Wu, and S. T. Wu, " Liquid crystal lens with large focal length tunability and low operating voltage", Optics Express, 15, 11328(2007). H. Ren, S.-T. Wu, and Y.-H. Lin, "Single glass substrate liquid crystal device using electric field enforced phase separation and photoinduced polymerization", Appl. Phys. Lett.90 191105 (2007). H. Ren and S.-T Wu," A liquid crystal-based linear polarization rotator", Appl. Phys. Lett. 90, 121123-1(2007). H. Ren, D. Fox, P. Phillips, B. Wu, and S. T. Wu, " Tunable-focus liquid lens controlled using a servo motor", Opt. Express, 14, 8031(2006). H. Ren, Y.-H Lin, and S.-T. Wu, " Linear to axial or radial polarization conversion using a liquid crystal gel" Appl Phys. Lett. 89, 051114(2006). H. Ren, Y.-H Lin, and S.-T. Wu, " An adaptive lens using liquid crystal concentration redistribution", Appl. Phys. Lett. 88, 191116-1(2006). H. Ren, Y.-H. Lin, and S.-T. Wu, " Polarization-independent and fast-response phase modulators using double-layered liquid crystal gels", Appl. Phys. Lett. 88, 061123-1(2006). Y. H. Lin, H. Ren, S. Gauza, Y. H. Wu, Y. Zhao, J. Fang, and S. T. Wu, "IPS-LCD using a glass substrate and an anisotropic polymer film", J. Display Technology 2, (March, 2006). H. Ren, S. T. Wu,"Polymer-based flexible microlens arrays with hermaphroditic focusing properties", Appl. Opt. 44, 7730-7734(2005). Y. H. Lin, H. Ren, Y. H. Fan, Y.-H. Wu, and S. T. Wu, " Polarization-independent and fast-response phase modulation using a normal-mode polymer-stabilized cholesteric texture" J. Appl. Phys, 98, (2005). Y.-H. Fan, H. Ren, and S. T. Wu," Electrically switchable Fresnel lens using a polymer-separated composite film", Optics Express, 13, 4141(2005). H. Ren, J. Wu, and S. T. Wu, "Phase-only modulation using a normal-mode liquid crystal gel", J. Appl. Phys, 98 (2005). Y. H. Lin, H. Ren, Y. H. Wu, X. Liang and S. T. Wu, " Pinning effect on the phase separation dynamics of thin polymer-dispersed liquid crystals" Optics Express 13, 468 (2005). H. Ren, Y. H. Fan, Y. H. Lin, and S. T. Wu, “ Tunable-focus microlens arrays using nanosized polymer-dispersed liquid crystal droplets”, Optics Communications, 247, 101 (2005). H. Ren, Janet R. Wu, Y.-H. Fan, Y.-H. Lin, and S.-T. Wu “Hermaphroditic liquid-crystal microlens” , Optics Letters, 30, 376 (2005). Y.-H. Wu, Y-H. Lin, Y. Lu, H. Ren, Y.-H. Fan, J. R. Wu and S.-T. Wu ”Submillisecond response variable optical attenuator based on sheared polymer network liquid crystal”, Optics Express, 12, 6382,(2004). Y. H. Lin, H. Ren, K. H. Fang-Chiang, W. K. Choi, S. Gauza, X. Zhu and S. T. Wu, “Tunable-focus cylindrical liquid crystal lenses”, Jpn. J. Appl. Phys, 44, 243 (2005). Y. H. Fan, H. Ren, X. Liang, Y. H. Lin, and S.T. Wu, “Dual-frequency liquid crystal gels with sub-millisecond response time”, Appl. Phys. Lett. 85, 2451(2004). P. T. Lin, X. Liang, H. Ren, and S. T. Wu,” Tunable diffraction grating using ultraviolet-light-induced spatial phase modulation in dual-frequency liquid crystal” , Appl. Phys. Lett. 85, 1131(2004). H. Ren, Y. Lin, Y. Fan and S.-T. Wu, " In-plane switching liquid crystal gel for polarization-independent light switch" J. of Appl. Phys. 96,3609 (2004). Y-H. Lin, H. Ren, S-T. Wu," High contrast polymer dispersed liquid crystal in a 90o twist cell", Appl. Phys Lett. 84,4083 (2004). H. Ren, Y. H. Fan, and S. T. Wu," Liquid crystal microlens arrays using patterned polymer networks", Optics Letters, Vol 29, 1608 (2004). Y. H. Fan, Y. H. Lin, H. Ren, S. Gauza and S. T. Wu, “Fast-response and scattering-free polymer network liquid crystals for infrared light modulators,” Appl. Phys. Lett. 84, 1233 (2004). H. Ren, Y. H. Fan. 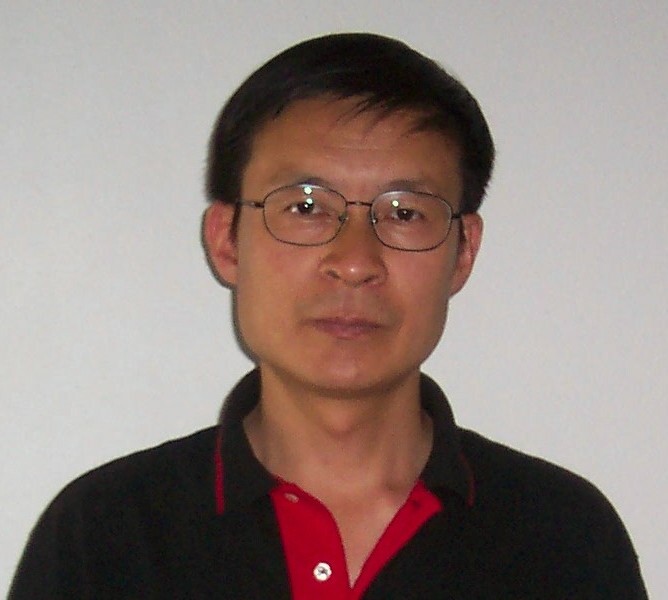 and S. T. Wu, “Polymer network liquid crystals for tunable microlens arrays,” J. Phys. D: Appl. Phys. 37, 400 (2004). H. Ren, Y. H. Fan, S. Gauza and S. T. Wu, “Tunable microlens arrays using polymer network liquid crystal,” Optics Comm. 230, 267 (2004). H. Ren, Y. H. Fan. S. Gauza and S. T. Wu, “Tunable-focus cylindrical liquid crystal lens,” Jpn. J. Appl. Phys. 43, 652 (2004). Y. H. Fan, H. Ren and S. T. Wu, "Switchable Fresnel lens using polymer-stabilized liquid crystals," Optics Express 11, 3080(2003). H. Ren, Y. H. Fan and S. T. Wu, “A prism grating using polymer-stabilized liquid crystal”, Appl. Phys. Lett. 82, 3168 (2003). Y. H. Fan, H. Ren and S. T. Wu, “Normal mode anisotropic liquid crystal gels”, Appl. Phys. Lett. 82, 2945 (2003). H. Ren and S-T.Wu, "Tunable electronic lens using polymer network liquid crystals", Appl. Phys. Lett. 82, 22-24 (2003). H. Ren and S-T Wu,"Inhomogeneous nanoscale polymer-dispersed liquid crystals with gradient refractive index", Appl.Phys.Lett. 81,3537 (2002). H. Ren, D. W. Fox, and S. T. Wu, "Liquid crystal and liquid lenses for displays and image procesing", SID'07, p1733(2007), invited talk. Y. H. Fan, H. Ren, and S. T. Wu, “Electrically controlled lens and prism using nanoscale polymer-dispersed and polymer- networked liquid crystals,” (Invited paper) Proc. SPIE (In press, 2004). Y.-P. Huang, X. Zhu, H. Ren, Q. Hong, T. X. Wu, S.-T. Wu, S.-H. Lin and H.-P. David Shieh, " Full-Color Trsnsflective Ch-LCD with Image-Enhanced Reflector", SID Tech. Digest 35, 882-5(2004). Y.-H. Lin, H. Ren and S.-T. Wu," Twisted PDLC for High-Contrast reflective Display,” SID Tech. Digest 35, 614-7 (2004). H. Ren, Y. H. Fan and S. T. Wu, "Anisotropic liquid crystal gels for display applications", (Invited Paper) Proc. International Display Manufacturing Conference, pp. 29-32 (2003). H. Ren, S. Gauza and S. T. Wu, “A High Contrast and Low Voltage PSCT Reflective Display”, SID Tech. Digest 34, 641-3 (2003). Y.-P. Huang, X. Zhu, H. Ren, T. Wu and S. T. Wu,” Full Color Transflective Cholesteric Liquid Crystal Display with Slant Reflectors above Transmissive Pixels, US 7027,118. H. Ren, Y.-H. Fan, and Shin-Tson Wu," Adaptive Liquid Crystal Lenses" US 6859333. Problems regarding this web site should be directed to Hongwen Ren. Last modified: 03/07/08.